Samsung Galaxy Note Review: Should You Upgrade Galaxy S2? Home /Phone/Samsung Galaxy Note Review: Should You Upgrade Galaxy S2? As a Samsung Galaxy SII owner upgraded from Samsung Galaxy S, my eyes gleamed when Samsung announced the 5.3-inch Galaxy Note (GT-N7000) – a larger version of the SII! Several months back, I reviewed the 5-inch Dell Streak and was tempted by its generous screen size. Thankfully, I did not have to wait too long before Samsung handed me a review unit of the Note. I certainly generated some buzz after posting some photos on my social sites as my friends kept asking me for my feedback. They all have heard of how fantastic the Galaxy SII was, yet they are enticed by the larger form factor of the Galaxy Note. There are just a couple of features that sets the Galaxy S2 and Galaxy Note apart. Processor. Note runs on 1.4GHz Cortex-A9 dual core. S2 is 1.2GHz Cortex-A9 dual core. While I feel that the S2 runs smoother and faster, the Note handles really well for a device with that screen resolution. Screen Size. Note is 1280×800 pixels (same as Galaxy Tab) and 5.3 inch. S2 is 800×480 and 4.3 inch. The advantages of a higher resolution screen is obvious: you can see more information in one page screen. Battery Size: Note is powered by 2500mAh while S2 is 1650mAh. I experience similar battery life between the 2 devices based on my kind of usage. Pen Input: Note supports the pen input to let you doodle stuffs. Interface: With a larger screen, Samsung tweaked the Galaxy Note’s home screens to display 25 app icons per screen instead of 20 on the Galaxy S2. Many of the widgets from the Samsung Tab are also made available on the Note. The Note also supports more gestures like palm swipe for screenshot, Pen double-tap to open S Memo Lite. I like that the home screen pages are looped. New calendar app, S Planner: With a larger screen, Samsung is able to squeeze in more information, smaller tabs to let you navigate faster. The S Planner is one of the apps re-designed for high-resolution small screens using pen entries. Weight. What do you expect with a 5.3-incher. 178g vs. 116g doesn’t seem much difference, but after you held the Note, the S2 felt feather-light. Using the Galaxy Note is both a joy and a chore. It’s a joy because of its generous screen size, which displays more things on one page. 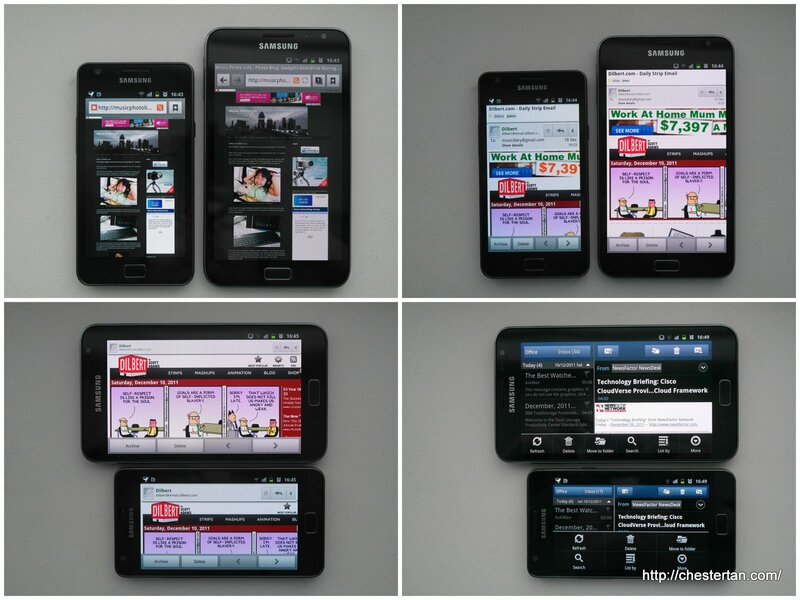 If you consume a lot of content and find the tablets too big, then the Galaxy Note provides a great proposition. The pen input offers another method to create content, and people who loves drawing or annotating will be able to use the Note for creative sharing of information. Yet, it’s a chore because you have to use 2 hands to navigate or type on the device. The Note requires a generous pocket size, and though it can fit in my jeans pocket, it does get a little tight when seated. With the Note, I cannot handle the device as nimbly as I would on normal-sized phones. My iPhone friend getting a hands-on with the Note. Another point to note is that not all Android apps are optimised for large screens. So on the Galaxy Note, some apps would appear with comparatively large buttons, while some might not display properly. For instance, when composing tweets on TweetDeck, the sets of icons below the “Send” button do not appear on the Note at all. In another instance, when using third-party app Widget Locker, I am unable to resize the custom slider as I did on my Galaxy S2, and I need to slide the slider at greater distances on the screen to activate the apps. On top of that, the Note feels less snappy than the S2, and that’s probably due to larger resolution and extra burden of the S-Pen functionality. Finally, the power and volume buttons are placed too high up on the Galaxy Note, almost beyond the reach of my fingers when holding the device naturally. This is a stark contrast to the Galaxy S2, where the buttons are placed closer to the mid-section, allowing ease of access by the fingers. The buttons are positioned at areas where I usually hold on when slipping in and out of my tight pockets, and that might activate the screen and potentially unlock the device. The S-Pen offers an additional input method on the Galaxy Note. When you need to jot down some important information, just double-tap with the pen and the S Memo window will pop-up on the screen without requiring you to leave your current app. Using the S-Pen, you can doodle with different pressure levels to achieve varying thickness, or pull-out menus with pen gestures. You can get greater accuracy when using the S-Pen for some tasks, including playing games – like Fruit Ninja. However, I don’t find the pen as sensitive as I expected. I had to give the pen a good press against the screen before it gets recorded as a stroke. The 5.3-inch screen is rather small to scribble a lot on one page, and I find it challenging to write with the S-Pen without touching other parts of the screen with my hand, as the Note also recognises body touches as inputs. The S-Pen is certainly a nice feature on the Galaxy Note and I would use it to spice up my photos with freehand sketches and for precision inputs. But it does not offer the same kind of pressure-sensitive entry like the normal pen tablets. The Samsung Galaxy Note screen size and the interface is clearly tweaked to improve usability akin to a mini-tablet, with the added convenience of the usual smartphone functionality. When I initially started using the Note, I thoroughly enjoyed the large screen experience. 5.3-inch is a comfortable size to consume content, and with a higher resolution of 1280×800, I can see more information without having to swipe around or zoom out. I can even type comfortably in portrait orientation. It has the exact same resolution as the large tablets, yet it is certainly much easier to carry around than the large tablets. But once I got comfortable fiddling with the Note attentively with 2 hands, I started using it like a normal phone. And that’s when I find myself stumbling somewhat, because the Note is too big to be handled like a normal phone. You do need to make adjustments to some phone-using routines and get accustomed to such a large phone. For instance, when your have your hands full of stuff, it would be a little tough to use the Galaxy Note with just one hand. And, you would need to tweak your wardrobe a little to accommodate the Note (no more tight-fitting pants). If you treasure the large screen and high resolution more than the slight bulk, then the Samsung Galaxy Note is definitely worth getting. You will get almost the similar smooth-performing experience as the well-received Galaxy S2, on a large-screen high-resolution format.